"Firestorm, the Guardian's multimedia interactive centred around this year's bushfires in Tasmania, was launched in tandem with Guardian Australia and has received widespread praise on the web for its moving and immersive portrayal of a crisis. 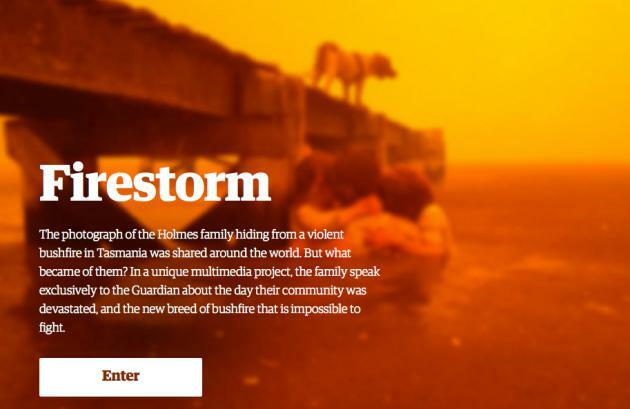 The interactive combines feature writer Jon Henley's text with video and audio footage, some shot by the Guardian team and some supplied by residents of Dunalley, the town at the heart of the story, as well as interviews with residents and maps of the area." "This is the story of a man, marked by an image from his childhood. The violent scene that upsets him, and whose meaning he was to grasp only years later, happened on the main jetty at Orly, the Paris airport, sometime before the outbreak of World War III. Later, he knew he had seen a man die. And sometime after came the destruction of Paris. ..."
Fig.1 [Français] Chris Marker (1962). "La Jetée", Argos Films.